I haven’t shared many personal stories on The Worktop lately. I’ve been getting straight down to the nitty gritty of the breakfast and brunch recipes. But a lot has been happening in our lives (namely, we have a toddler running around causing havoc). This post for healthy Toddler Pancakes is developed for, tested by, and approved by our little toddler. 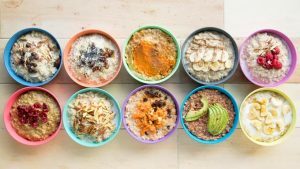 Since we had our baby a year and a half ago, I get asked the question “what does your toddler eat for breakfast?” all the time by other moms who know I write a breakfast and brunch blog. I always shy away since I don’t want to admit that my toddler often just “requests the tasting menu“. What does that mean? It’s our way of making ourselves feel like he has a refined palate, but in reality, he takes one bite out of everything on his plate, then asks for other things. Until he finally decides to eat, every item of food ends up on the floor, his hair (or the ceiling!). But we have recently entered a pancake streak. 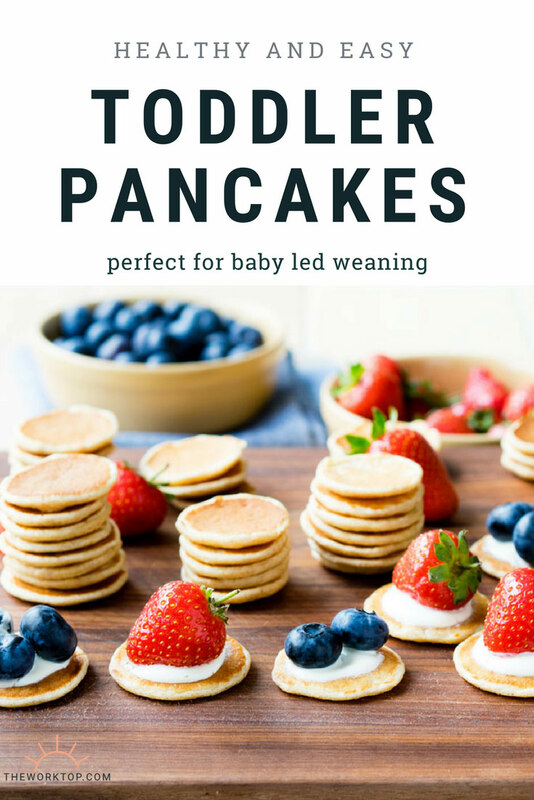 Even though I have been feeding him these pancakes since he was a baby (this is a great recipe for baby-led weaning), our toddler only recently decided that he absolutely loves pancake and needs them all the time. Making pancakes has become a fun morning activity that we do several times a week. 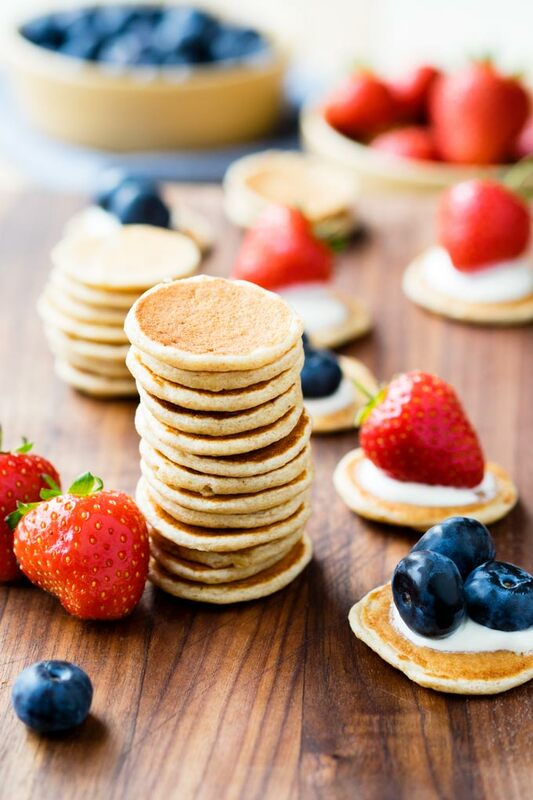 Yes, these healthy Toddler Pancakes are so easy to make, you can even make them on weekdays! 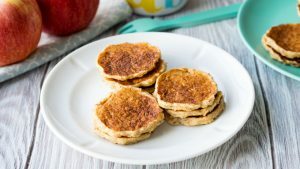 While this recipe is for the most basic toddler pancakes, other ones he loves are: Healthy Apple Pancakes, Vegan Banana Pancakes, and Free From Pancakes. 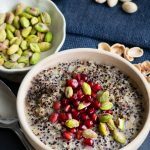 There’s so much that a toddler can help with – pulling the ingredients out of the cupboards, beating the egg, pouring in the milk, scooping in the flour, spooning in the baking powder, pouring in the melted butter and mixing everything together. 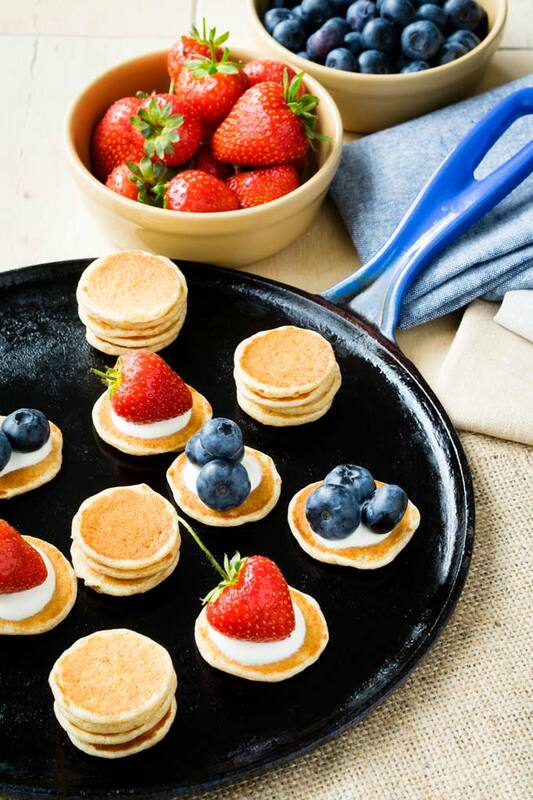 Because these pancakes are mini, they cook very quickly on the stovetop. On my round pancake pan, I can fit 12 pancakes at once. Two rows of three pancakes (top and bottom), and 2 rows of four pancakes (middle rows). I stand the toddler in his kitchen helper, and he stays put the entire time since there’s always something going on to help with or watch. We drop the pancake batter on the pan by the teaspoon (Yes, teaspoon – you read that right. It might sound tedious, but it goes by quickly) and count each number out loud. These pancakes are so quick to make our toddler is entertained the entire time it takes to cook them! By the time we drop all 12 teaspoons of pancake batter on the pan, the first pancake is ready to be flipped. We count again as we flip. And by the time the last pancake on the pan is flipped, the first pancake is ready to be removed from the pan (another chance to count to 12). A batch of these toddler pancakes cooks in no time, and our little one starts eating the pancakes right away. Between the bites, he helps me finish cooking the rest of the batter. Our toddler loves making these pancakes, but I also do too because they are so easy to make, healthy and nutritious, and freeze well. 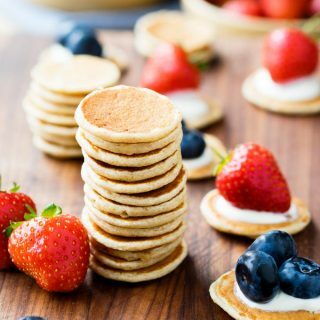 When we make this Toddler Pancake recipe, I end up with additional healthy breakfasts and snacks on hand. You likely already have all the ingredients that you need for these Toddler Pancakes. 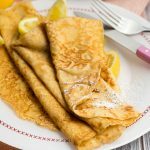 This pancake recipe doesn’t require any special ingredients – just egg, flour, milk, butter and baking powder. 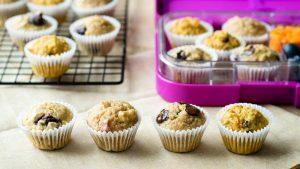 If you have self-rising flour, you can cut it down to four ingredients (leave out the baking powder). This recipe makes 5 dozen Toddler Pancakes. There is no way that my toddler can eat that many pancakes. No problem though! There are a couple ways to handle this. You can make all five dozen pancakes, eat what you can, and freeze the rest. This is what I normally do, because that means our toddler can have pancakes any time. 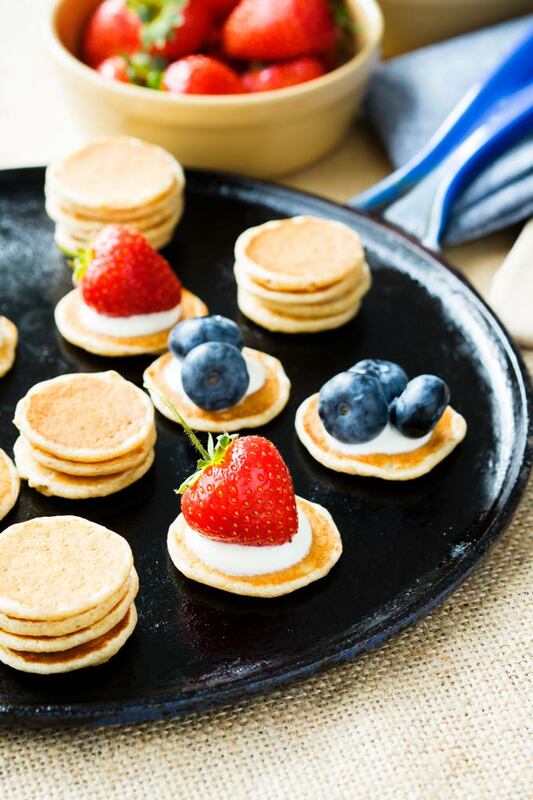 These mini pancakes take just a few seconds in the microwave to defrost. Alternatively, you can make one dozen Toddler Pancakes, and cook the rest of the pancake batter into larger sized pancakes for the other family members (use about 2 tablespoons of pancake batter and cook the pancakes a bit longer). These pancakes are healthy – made with whole grains, egg and milk. There are no added sugars. 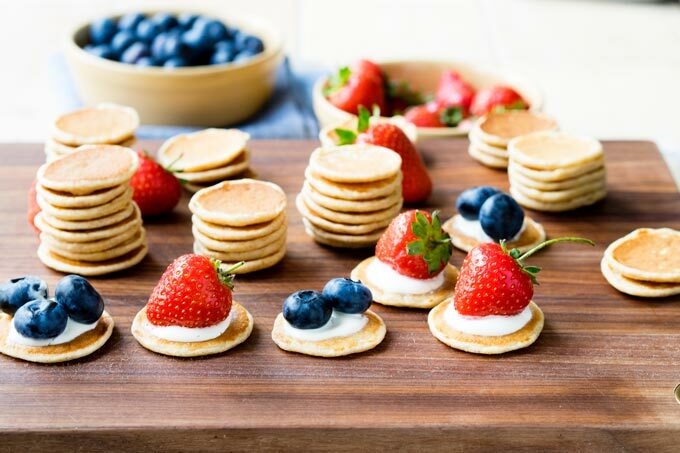 These pancakes are the perfect grab ‘n go breakfast, lunch, or snack for a toddler. 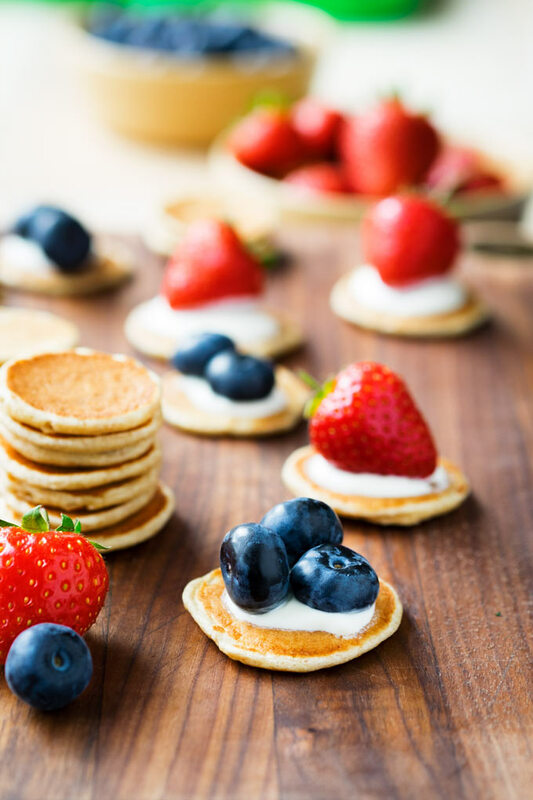 Pancakes are easy to pack up and bring with you out, and these healthy pancakes are great to eat in buggies (strollers). 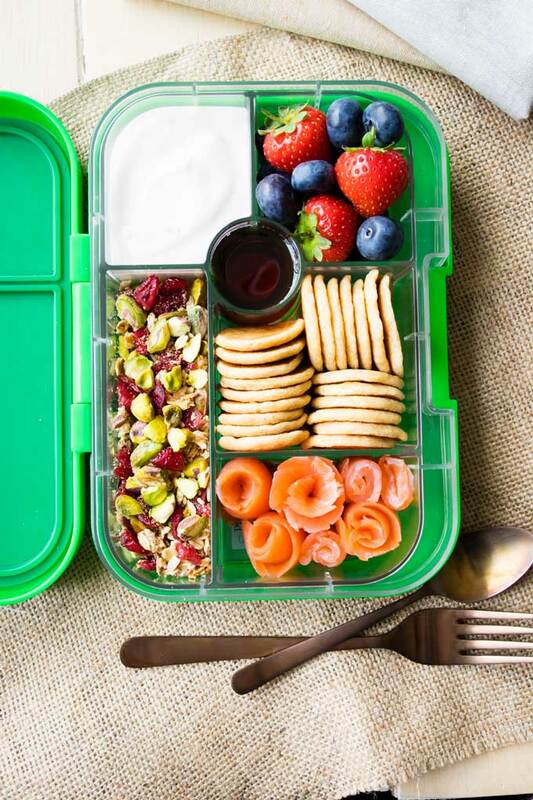 They don’t drop crumbs everywhere, and they don’t leave behind sticky fingers. The pancakes themselves are also easy (and clean) for baby-led weaning. In a medium bowl, beat the egg. Mix in the whole milk. Mix in the flour and the baking powder, and If using, the optional add-ins. Heat a griddle to medium heat and lightly grease the pan. To make 1-inch pancakes (like in the photos), drop on the pancake batter using a teaspoon. To make 2-inch pancakes, drop on the pancake batter using a tablespoon. 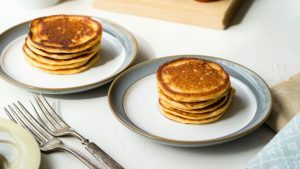 Cook, until the tops of the pancakes have bubbles on them, the batter is no longer shiny, and the bottom of the pancakes are a light golden brown, about 45 seconds to 1 minute. Flip and cook for an additional 45 seconds to 1 minute, until the bottoms are also golden brown. Remove from heat and set on a plate to cool. 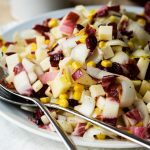 Serve with a dollop of plain greek yogurt and fresh berries. *Note many pediatricians recommend waiting until your baby is at least 12 months before introducing honey because it may contain spores of bacteria that can cause botulism. How long can they stay in the freezer? Can you freeze them with banana added? Can I refrigerate the batter instead ? Hi – I was always told that milk as an ingredient is fine. You can always replace it with a dairy-free alternative if you prefer. My son also has an egg, corn and peanut allergy. 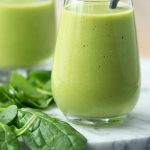 Any other breakfast or food recipes that are toddler friendly you can share that are a bit in your home!? Thanks! 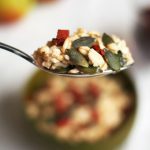 Hi Krystal, I have lots on the site since I post a lot of recipes we eat at home! 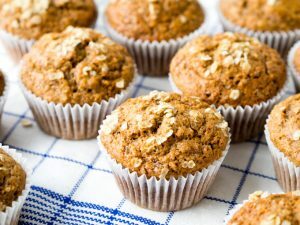 You might enjoy these to start with: Free From Pancakes for Babies, Vegan Blueberry Muffins, Vegan Cinnamon Muffins, Egg Free Banana Muffins, and Homemade Breakfast Sausages. But click around and you’ll find more. Hi! 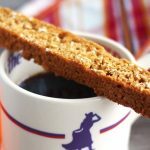 Can I substitute the whole wheat flour for almond flour? Hi Elizabeth, I haven’t tried it that way. Almond flour and wheat flour are quite different so I’m not sure. But at the same time, I think it’s worth trying. Especially if you keep the pancake size small, it might be ok (though the taste and texture will be different to the original recipe). These are great! How do you freeze them? Hi Amanda, they freeze very fast and easy. I just lay them on a cooling rack, and place in the freezer. 10 min or so later, bag them up into freezer bags. Tried it with a few substitutions. I used almond milk instead and I omitted the butter. 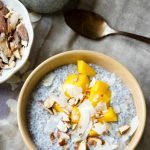 I added the cinnamon and the vanilla and cooked in coconut oil, they turned out delicious! Thanks so much! Hiya, how many grams of flour would it be? I’ve tried making this using a google conversion for grams and it created an impossibly thick dough. Hi- it should be 130 grams. There’s a button on the recipe under the ingredients, and you can convert it all to metric measurements. Hey tina! Thks for the recipe! I tried it this morning but they turned out looking like thin crepes instead. Any thoughts on what might have gone wrong?! Hi – it’s one US customary cup measurement, or 235 milliliters.